Banana is one of the most commonly eaten fruits. It is one of the sweetest fruits and doesn't require too much sugar when used in desserts which makes it a healthier option over other rich desserts. Here are some dessert recipes which are quick, easy and absolutely delicious! • Heat oven to 190O C.
• Cut bananas into slices and place it on a pie plate or a bowl. • Spread butter on the bananas and drizzle orange juice and lemon juice. • Sprinkle sugar and coconut. Bake till coconut turns golden. This will take about 8-10 minutes. • Serve hot or chilled. 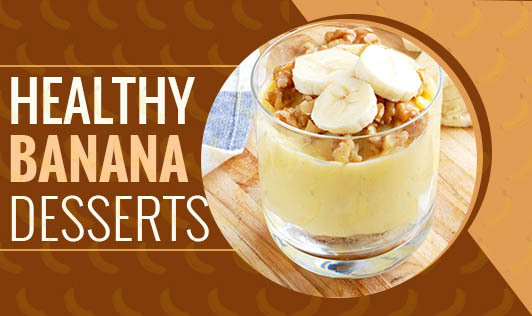 • Slice bananas into thick slices. • Heat a flat pan and add ghee. • Add the sliced bananas and sugar. • Sauté till the bananas turn golden brown. Do not wait till it turns dark brown as it will turn bitter. • Serve with ice cream, breakfast cereals or yoghurt. • Cut banana into small pieces. • Roll the bread slices really flat with a rolling pin. • Apply butter and sprinkle sugar and cinnamon powder. • Place 2-3 tsp of cut bananas on the bread slice and roll the bread slice. • Place the rolls in a muffin tray or a greased tray. • Bake at 200o C in a preheated oven for 15-20 minutes or till the bread turns golden brown. • Let it cool and serve. • Chop apples and slice bananas. • Mix custard powder with ¼ cup of warm milk and keep aside. • Bring milk to boil. Add sugar and mix well. • Simmer and add custard mixture. Stir continuously till the custard thickens and refrigerate for 30 minutes. • Place a layer of apple and banana in a bowl. Spread custard evenly on top of it. Repeat this for 2-3 layers and refrigerate till serving time. • Drizzle dark chocolate sauce and serve.